Was it worth the wait? Marvel hadn’t given us much of anything on the sequel to Infinity War, up to and including what the film would be called. Many speculated that was because the title itself might be a spoiler of sorts, or at least a clue. Now, with the film’s scheduled release less than five months away and the first trailer is out, we know the film is titled Avengers: Endgame, and we know it looks bleak as hell. First of all, the title obviously references a key Infinity War moment, when Dr. Strange tells Tony Stark why he gave Thanos the Time Stone, saying “We’re in the endgame now.” That’s the portion of a contest in which everything will be decided, and it’s a fitting title here. As for why Marvel would hold the title back from release despite it not being an obvious spoiler: Dr. Strange’s talk with Tony is considered a key moment because Strange saw the only future in which Thanos lost. Just about every fan theory about how the Avengers will undo Thanos’s snap judgment centers around that interaction and Strange’s decision to give up the Time Stone to spare Tony, so the title also referencing that moment could be a big sign that everyone was onto something. 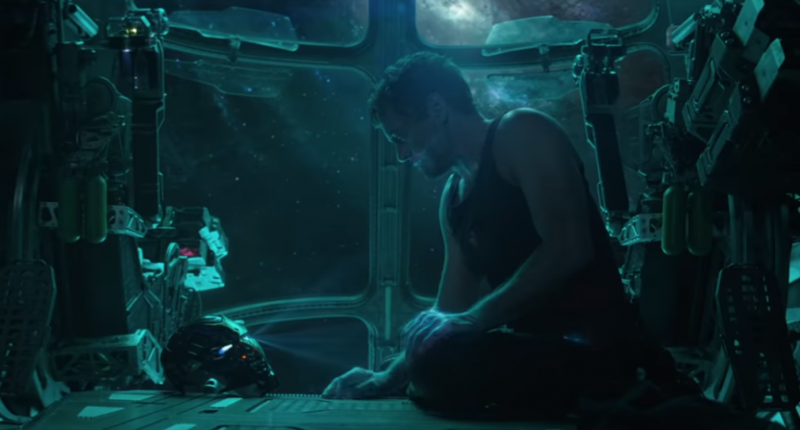 As for Tony himself, we see he (and Nebula, it looks like) adrift in space, with no food or water, a dwindling oxygen supply, and no hope of rescue (or hope of any kind.) It’s the most dire situation Tony’s found himself in since the terrorist’s cave compound back in the original Iron Man, and while logically we know he’s going to somehow be saved, he clearly doesn’t know that, and things look quite dire. That’s a theme for the whole trailer, which makes sense; the universe post-Thanos seems like a horrible place to exist, from the few glimpses we get. And we don’t get much; aside from the sequence with Tony, we get Captain America and Black Widow plotting, well, the plot, Thor looking distraught, the return of Hawkeye (now, apparently, a street ninja vigilante of some kind), and the stinger is Ant-Man attempting to rejoin the crew. The last bit might seem like just comic relief, or an odd choice for the closing moments of a trailer, which is typically used for a semi-important reveal. If you’ve seen Ant-Man and the Wasp you already know Scott Lang survived the snap, so of course he would be a part of Endgame. But another popular fan theory component is Ant-Man’s access to the quantum realm; combined with the title, it could be seen as a hint fans were right. Or maybe they just wanted to end the trailer on a slightly less dour note. The entire first phase of the MCU is one of the more ambitious things a studio has attempted. It’s been an astounding financial success, and it’s surprising that it’s worked out as well as it has so far creatively. An unsatisfying conclusion could undo a lot of that, of course. But Marvel, the Russo brothers, and everyone else involved deserve the benefit of the doubt.